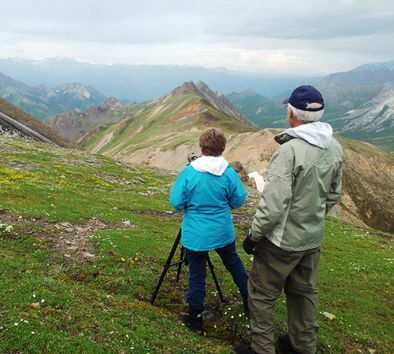 Hiking with an experienced naturalist guide is a great way to explore the forested area near the Nenana River, and learn about the highly adapted organisms that inhabit the mountains on the north side of the Alaska Range, and around the globe in the subarctic habitat. This narrated wilderness hike covers more ground than a walking tour,and offers travelers more time to explore the glacier topography, and subarctic ecology in depth. Alaska’s backcountry is part of one of the largest wilderness areas on earth. Walk out and really discover this remarkable place for its immensity, seasonality, and beauty. Hikes are operated in front country trails within Denali National Park and in the wilderness areas surrounding it. Maximum age is 80 years. Maximum weight is 300 lbs. Must be in good physical condition. Wear outdoor clothing and hiking shoes. Bring water and snacks. Trekking poles provided. Extra rain gear available, if needed. Tour is not suitable for pregnant women. Guests with back, neck, heart or mobility problems are not allowed to participate. Tour operates rain or shine, but may be cancelled by the operator in the event of extremely bad weather or unsuitable conditions. Tour operates subject to meeting a minimum number of participants. Wildlife sightings are likely but not guaranteed. Hiking is approximately 4½ hours.